Today’s rendering, done with graphite, black colored pencil and white gouache paint on vellum paper, is a simple design. 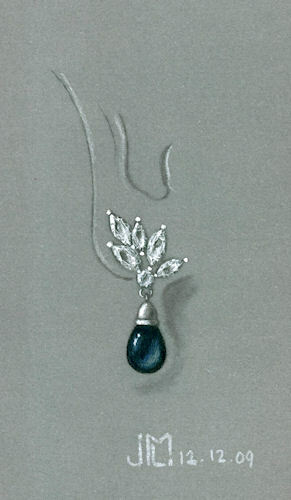 However, I think the organic placement of the marquise diamonds in the cluster portion of the earring give what is a more classic design a modern and unique twist. Over the next three days, I’ll be posting the design process from start to finish for what has been my most involved rendering project to date. The holiday is a nice time for family and surprises, and this latest project has elements of both. Stay tuned!